Our Astronomy Sofware is Better Than Ever! 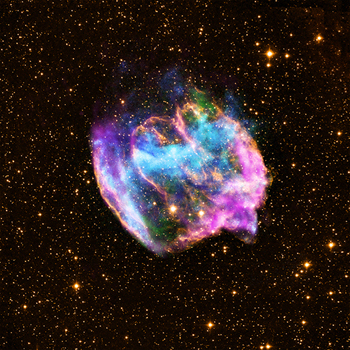 An image from Virtual Planetarium of an exploded star located 26,000 light-years from Earth! BTW, rest assured that, should your star explode, we offer a money back guarantee! 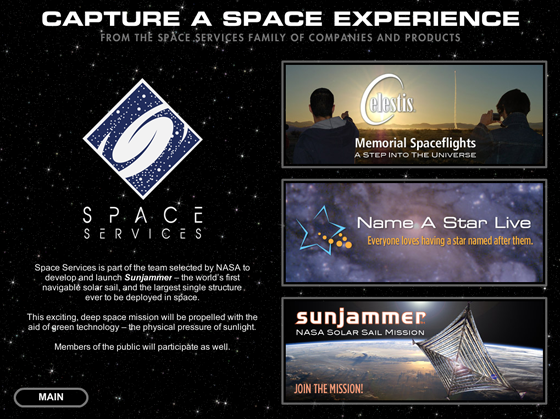 One of the ways Name A Star Live makes the symbolic gesture of naming a star real is by offering our customers Virtual Planetarium™ astronomy and space software. We include this software in our in our Deluxe, Framed and Ultimate Gift Sets, as well as one of our Instant Gift Sets. The software includes a library of stunning astronomy imagery; information about the sky, the solar system and the latest space events; and space weather reports about sun spots, auroras and more. With an Internet connection hundreds of images can be updated with live satellite data at the click of a button. The software was developed by Rice University and the Houston Museum of Natural Science. We recently made several very significant upgrades to the software, which we outline below with screenshots from the software. You can purchase Virtual Planetarium separately. If you already have Virtual Planetarium, you can easily update your software yourself. 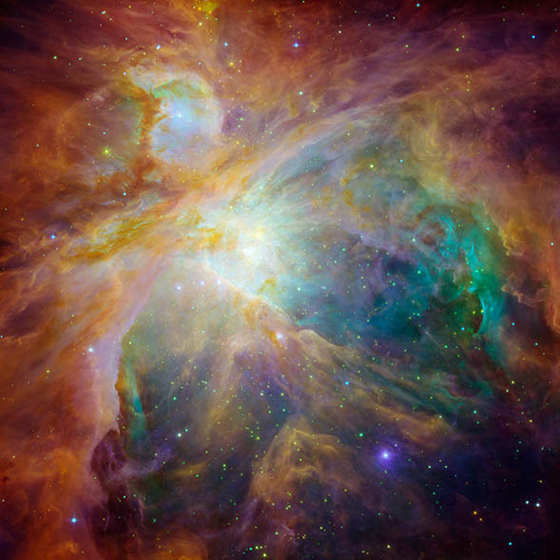 Here’s another beautiful image from Virtual Planetarium: the famous Orion Nebula — a giant, illuminated cloud of gas and dust where stars are born. Under dark skies, you can easily see the Orion Nebula with your naked eye, although it looks much more impressive through a telescope! 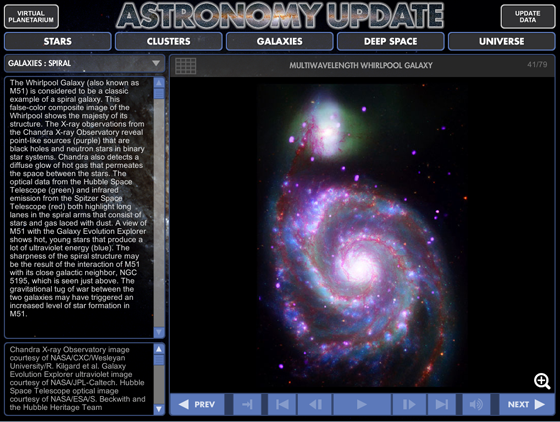 We’ve added over 100 new astronomy images to Virtual Planetarium! See some of the most beautiful photos of stars, clusters of stars, galaxies and other deep space objects, like the Orion Nebula. Each image includes detailed information about the object you’re viewing. You can zoom in to get a better look, and click on links to learn more online. In addition to learning about astronomy, Virtual Planetarium helps you do astronomy. 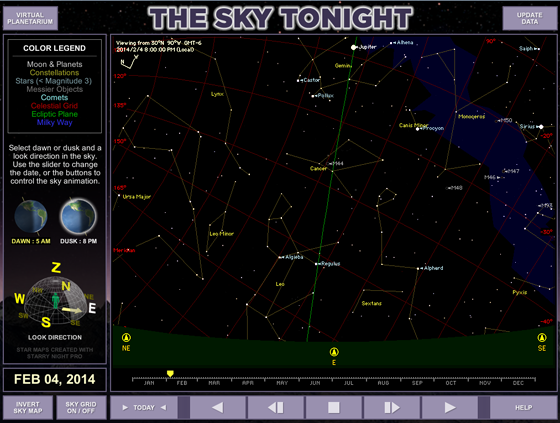 “The Sky Tonight” module shows you the planets, constellations and major stars visible from your location on any night of the year. While the software will not show your particular star (you need a Star Chart for that), you can use the software along with your Star Chart to see where the star you named is located in your nighttime sky. You can select what your sky will look like at 8 pm or 5 am local time. (That provides a good guide for any evening’s stargazing.) And you can select the “LOOK DIRECTION” — North, East, South, West or “Z,” which stands for “Zenith” — the point directly overhead. The green line represents the “ecliptic” — the path the Moon and planets follow through the night sky from night to night. And, like with most other modules in Virtual Planetarium, you can click on the “UPDATE DATA” button to download the latest astronomical information for The Sky Tonight module. If, after viewing a planet in the night sky, you want to learn more info about that planet, check out Virtual Planetarium’s “Solar System Update” module. Just choose the solar system object that interests you — such as Mars, Saturn, or Earth (where you’ll find info about the Moon). Here, we’ve chosen Comet ISON, which we reported on in other blog posts last year. 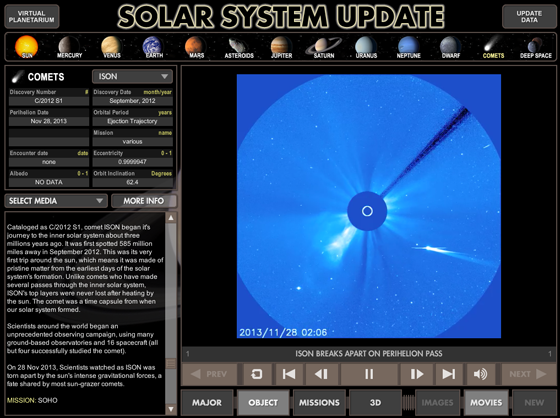 This screen shot shows part of a video where we see Comet ISON approach the Sun, which is covered by the disc in the middle of the screen. “Perihelion” marks the comet’s closest approach to the Sun where the comet broke apart. Celestis Memorial Spaceflights launch a symbolic portion of one’s cremated remains into space. Celestis offers missions into Earth orbit, onto the lunar surface or into deep space. Missions into space that return the cremated remains to Earth are also available. Sunjammer is NASA’s first solar sail mission to deep space and the largest sail ever flown. As a NASA Technology Demonstration Mission, Sunjammer is the final step before solar sails are integrated into future space missions. On board Sunjammer, advanced technologies will provide Earth with its earliest warning to date of potentially hazardous solar activity. Additionally, the Cosmic Archive will carry a message of hope for future generations expressed through the letters, music, and photos of people from around the world. As a Name A Star Live customer, your star name will be on board this mission!